Hey all, my drivers side key lock for the door broke this morning. You can turn it both ways and nothing happens. I unlocked the trunk to get in to the car, but now I cannot lock the car. If I try to lock the passenger door or the trunk it just locks and then immediately unlocks...can I disable this or what can I do? Just bought this new driver's side lock cylinder assembly so this will serve as a good reference. Here is a possibility. 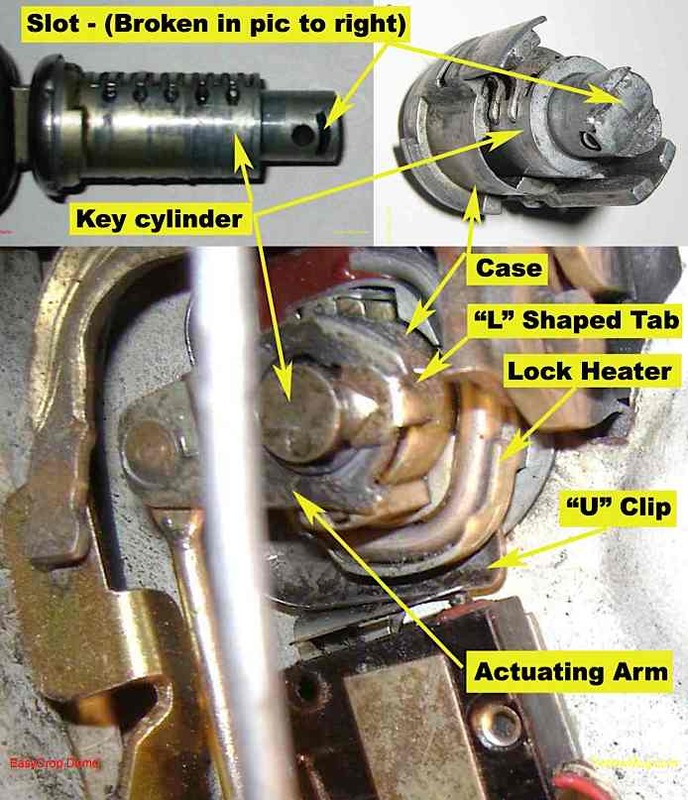 Since your lock cylinder still turns normally, I believe the rod that connects to the lower lock assembly has come loose or worse yet, the attachment to the lock cylinder is broken. The above pic will show this part. When this rod is not actually connected to the lower lock mechanism, this may signal to the central lock system that one of the doors or trunk is not completely latched, thereby, it will perpetually lock and unlock all the locks. To deactivate the central lock system, disconnect the 30A #27 fuse. All the locks will now work independently, albeit a little more force is required to work them. Getting back to the rod assembly, there is a clip that locks the end pin to the lower lock mechanism, maybe this has come loose and just needs to be reconnected. Don't believe there are separate replacement parts of this complete lock assembly, therefore a whole new unit needs to be replaced if there are other broken parts that are causing your lock problem. Once again, my scenario is just a possibility! There maybe other factors involved here. Last edited by M6csi; 03-12-2011 at 09:48 PM. Agreed, the clip end of the cylinder broke on mine and you need the whole assembly that is pictured. It's a real joy to install too. Just did mine and this info helped. Good luck it's a PITA. M6csi, how much did that lock assy. set you back? Is that one of the items BMW has reduced the price on? This is the exact area that broke on my lock cylinder. It was so bad that the lock cylinder just popped completely free from outside the car. I was hoping to find an used set to rekey but as most of us know, these in good condition are somewhat hard to come by. So, with the recent BMW price reductions, I took the plunge and bought a new one. At its highest point, the entire lock assembly was about $200. Bought mine at a local SF BMW dealer for $145, including sales tax, the total amount was $160. Proof of car title was needed for order. Should have ordered one from www.getbmwparts.com as one board member had recommended. Their price is slightly less than $120 with no sales tax to boot and the shipping cost should be negligible. Have to say this dealer's pricing on parts are the lowest anywhere. What's interesting is the lock cylinder repair kit is about the same amount as the entire lock assembly, thus, getting the repair kit does not really make much sense, both price wise and the work involved to disassemble and repair the lock assembly. Have not had the opportunity to install yet. i just had this issue with my 87 635 drivers door lock cylinder. the end which holds the L-pin has snapped off just like the pictures above. How do you know if it is a 4 or 5 key code? I have seen repair kits from http://www.ecstuning.com/BMW-E24-635...08/]ECS tuning for $18 bucks, but it does not seem to have the same end where the L-pin would attach the cylinder to the arm actuator. Will that repair kit work? If not, can anyone suggest where I may find the proper key cylinder that has the proper end for the L-pin? Are there repair kits for the 5 key code? Thanks in advance. To answer just the last question, once you figure out how to replace the pins to conform to the key, you'll see that not all of them are required. It may make the lock a little less secure (a pick only has to move four instead of five pins), but it will be functional. I've redone a few lock cylinders like this in the past. It's no big deal. Not a lotta people trying to steal 30-year-old BMWs. No, the $18 one is for the early cars that only turn 45 deg. and don't have the deadbolt feature at 90 deg. like your '87. ECS Tuning has the repair kit for your car (code 1001) for $110, but they list the entire assembly as shown above in M6csi's post for only $106 !! You get the cylinder, the connecting rod, a new lock heater and I believe a new key!! That seems to me the way to go. I don't believe the 4 or 5 key code is an issue as Der Krieger says. There are 11 slots for tumblers and either 4 or 5 sizes of tumbler for each slot. If you get the right part number for your VIN, it should come with the right tumblers whether you get the repair kit or the entire assembly as shown above in M6csi's post. This sure seems to be the way to go. I wounder if we could impose on you to visit a thread that is being revived about Lock cylinders where you posted a photo of a lock assembly that you bought and had yet to install and answer a few questions? 1) Do you have the part number of the assembly? I'm not sure if the M6 has the same PN as the 635?? In any case was it referenced as "code 1001" in RealOEM as opposed to "code 5000"? I'm guessing that is the difference between later and earlier cars? 2) Did it come with a Key? If so, was it blank or was it cut to the VIN code, i.e. did you have to send in your VIN or Registration? 3) If it was blank, did it come with extra tumblers to match to an existing key? ECS Tuning is selling the repair kit for $110 and the entire assembly for only $106!! 1) Yes, the lock tumbler/lock assembly is the same for all late E24s. The part # is: 51 21 1 886 521 and the lock code is 10001. 2) No, it does not come with a key, it's keyed to your VIN. One would need to provide proof of vehicle registration under your name and your driver's license. Suppose if you order the assembly through an online retailer, then you can probably fax the documentations to them. The repair kit with all the nylon parts shown from ECS sure looks like the passenger side lock. I have never seen an early E24 driver's side lock assembly, therefore, I don't know whether it is interchangeable. As I stated before, for about the same amount, it does not make much sense not to buy the whole lock assembly. Last edited by CW6er; 07-01-2014 at 02:38 AM.